Between 2000 and 2006 members of the rightwing extremist terror group National Socialist Underground (NSU) murdered nine small business owners – eight of Turkish and one of Greek descent – and one police woman in cities across Germany, all with the same handgun, a Ceska 83 Browning. The group also committed two bomb attacks and fifteen armed robberies. For many years, however, investigations of this series of violent attacks, targeted and scapegoated the families of the victims rather than revealing links to the terror organization. The NSU trial, which lasted over five years from 2013 to 2018, was one of the longest and most expensive of German history. The two main perpetrators had committed suicide, their female accomplice was sentenced to lifelong prison. What was really on trial was the credibility of the rule of law vs. bifurcations of institutional racism. 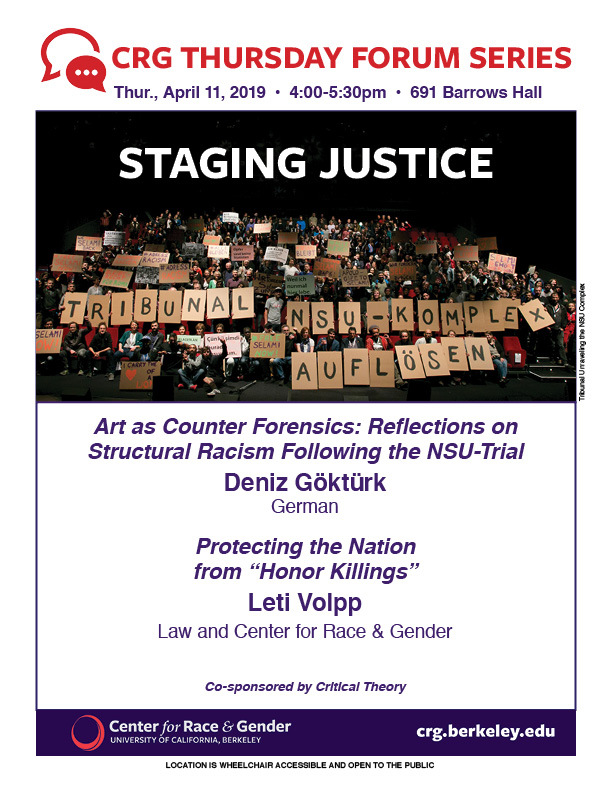 For the families of the victims and, more broadly speaking, citizens and residents with “migration backgrounds,” the NSU murders and the subsequent flawed investigations have become a haunting trauma; the trial failed to restitute confidence in the justice system. Organizations of civil society have staged tribunals, commemorating the victims, fostering public conversation, and demanding further investigation. Theaters, art exhibitions, and moving image productions such as docudramas and videos have provided a stage for “counter forensics” (Eyal Weizman), reconstructing a field of vision, and an alternative quest for justice. In her presentation, Göktürk raises questions about the role of evidence and truth claims in the arts. What happens when theater becomes a tribunal of justice? And how does the theater’s focus on presence, acting, and public assembly converge with digital media of recording, storage, and circulation or with reenactment in cinema? In our era of “post-truth” and “alternative facts,” what is the role of art in creating and complicating common conceptions of reality? Göktürk argues that the efficacy of such interventions can only be assessed by attention to their media-specific configurations of imagination, address, and empathetic implication of spectators. Deniz Göktürk is Professor and Chair in the Department of German at the University of California, Berkeley. Her publications include a book on literary and cinematic imaginations of America in early twentieth-century German culture as well as numerous articles on transnational migration, culture, and cinema. Her new book Framing Migration: Seven Takes on Borders and Mobility is forthcoming with De Gruyter Verlag in the series Interdisciplinary German Cultural Studies. She is co-editor of The German Cinema Book (BFI 2002, new expanded edition 2019); Germany in Transit: Nation and Migration 1955-2005 (Berkeley: University of California Press 2007); Transit Deutschland: Debatten zu Nation und Migration (2011); Orienting Istanbul: Cultural Capital of Europe? (Routledge 2010); Komik der Integration: Grenzpraktiken der Gemeinschaft (2019). She is coordinator of the Multicultural Germany Project and concept coordinator of the electronic journal TRANSIT. Seven days after his presidency began, Donald Trump issued an executive order titled “Protecting the Nation from Foreign Terrorist Entry into the United States.” Amidst the mass chaos this order produced at airports around the world, largely overlooked were provisions invoking “honor killings.” While the Trump administration withdrew that executive order and replaced it with a second, and then a third, a provision mandating data collection on “honor killings” still exists as a legal requirement. Why did “honor killings” appear in these executive orders? What role did they play in the text? And how has data about “honor killings” in the United States been manufactured and misinterpreted? This lecture will examine what work “honor killings” do, and how they have emerged as a problem for U.S. governance. Leti Volpp is the Robert D. and Leslie Kay Raven Professor of Law at UC Berkeley and the Director for the Center for Race and Gender. Recent work includes the co-edited volume Looking for Law in All the Wrong Places (Fordham University Press, 2019) (with Marianne Constable and Bryan Wagner); “DACA, DAPA, and Discretionary Executive Power: Immigrants Outside the Law,” California Journal of Politics and Policy (2019); “Refugees Welcome?” La Raza Law Review (2018); “Passports in the Time of Trump,” Symploke (2018); and “Feminist, Sexual, and Queer Citizenship” in the Oxford Handbook of Citizenship (2017).